Noreen Ehrlich is a Success and Relationship Coach who inspires her audience to IGNORE CONVENTIONAL WISDOM in order to create TRUE SUCCESS. As a former Wall Street CFO and now Life Coach, she has the privilege of helping her clients gain clarity and hit their dream targets. Join Noreen and her talented team weekly as they talk to guests from all walks of life who share their perspectives on how they DEFY & HUSTLE. You´ll be captivated as they openly delve into everything and anything that creates a life well lived! Your time is precious. It is time to stop HIDING and start HUSTLING. 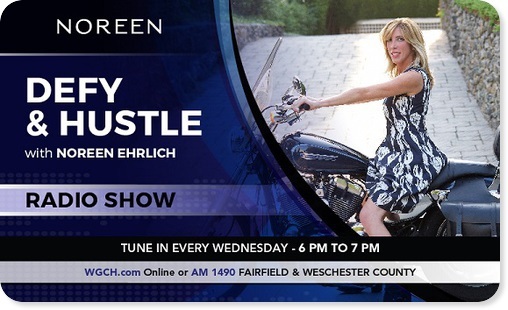 Find out what that means by listening every Wednesday from 6 to 7 PM for DEFY & HUSTLE with Noreen Ehrlich when she will approach your everyday issues with wise but uncommon sense.